Starting from the intersections of Routes 14 and 224, follow Route 14 south for 1 mile and turn left (east) onto Havana Glen Road. In 0.3 of a mile turn left (north) onto L’Hommedieu Street. After 0.4 of a mile turn right (east) onto Catlin Street, at the end of which is a small parking area. From the parking area at the end of Catlin Street, follow a short trail along the south bank of Deckertown Creek (sometimes called Catlin Mill Creek) and descend to the creek bed. 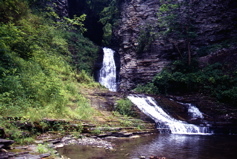 The small waterfall before you is known as Lower Deckertown Falls. It faces to the southwest, is 12 feet high and has a 6 foot wide crest. From this area you will be able to see the upper part of Upper Deckertown Falls in the distance. and faces to the southwest. 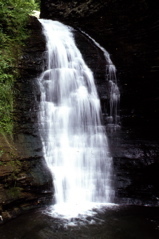 When you have made your way upstream of Middle Deckertown Falls you will be able to see the full face of Upper Deckertown Falls. This spectacular southwest facing ribbon falls is 36 feet high and has a 10 foot wide crest. 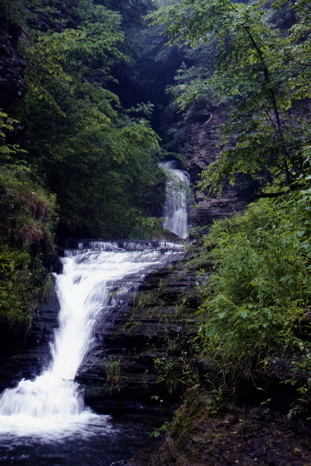 The creek emerges from a narrow gorge and plunges 36 feet in an extremely steep cascade. Ledges near the base of the falls will allow you to get up close to this wonderful waterfall.